A freezer is an important investment – and one that should be protected. With the right care, a freezer can provide a convenient (and arguably indispensable) means of storing food for long periods of time. But what exactly do you need to do to care for your freezer properly? Let’s examine the question and suggest ways in which we might maximise the lifespan and effectiveness of this essential household appliance. The best way of measuring a freezer’s performance is through its temperature – after all, a freezer that can’t keep its contents at a stable temperature is not a fully functioning one. In order to ensure that the food in your freezer is safe to eat, this temperature should be around -18°C (or 0°F). A little bit either side of that shouldn’t cause problems but a consistently overwarm or overcool freezer is almost certainly a malfunctioning one. Ideally, your freezer will come with a built-in thermometer on the exterior of the cabinet to allow you to take a reading without having to open the freezer door. If your freezer lacks this function, you can buy an inexpensive thermometer and keep it inside your freezer for that same purpose. How conveniently you’ll be able to access the freezer’s contents. The first of these considerations speaks for itself – if you’re going to be using your freezer most days, it’s important to place it somewhere that’s easy to reach. The second consideration is almost as obvious – or at least, partly so: if a freezer is placed in a room where it’s frequently very hot, then it’ll be forced to work harder to maintain its temperature and its lifespan is likely to be shorter. If you’re positioning your freezer in the kitchen, then you might imagine the greatest threat would be posed by your hob. Fortunately, heat rises – and so a freezer that’s placed below counter-height will likely be shielded from much of the heat. Of far greater concern are integrated freezers placed immediately next to ovens – try to leave at least a few feet between the former and the latter. If you’re placing your freezer in your garage, winter temperatures might actually inflict damage. This is because the condensation that comes from transferring heat from the inside of the freezer to the outside can cause tiny droplets of water to form – and if they work their way into the freezer’s innards, they can cause problems. Generally speaking, temperatures over 30°C and beneath 10°C are to be avoided – but the comfortable room temperature of a kitchen should be ideal. When you first get your freezer, there’s a chance that the oils inside the compressor will have leaked into the refrigeration system. This might cause it to become blocked if the system is switched on. By leaving it to stand for a few hours, you’ll allow those oils to settle back into their proper position. Consult the manual of your freezer for a specific recommendation about how long to wait – though if the freezer has been laid down, you might wish to wait a great deal longer. Depending on the exact model of your freezer, you’ll need to leave it in position and on for anywhere between a few hours to an entire day before filling it with food. Remember, you’re looking to achieve a stable temperature of around -18°C; if your freezer has a built-in thermometer, then be sure to check it regularly to see when the temperature has been reached. Save money when you buy a brand-new freezer today at Ship It Appliances. Check out our line of high-quality freezers from market-leading brands and grab yourself a great deal! How Long Can a Freezer Go Without Power? Eaten the contents of the freezer. Moved the contents of the freezer to another, functioning freezer. Can My Freezer Be Too Full? As we’ve seen, a packed freezer can be beneficial when power is cut off from the freezer. But are there any downsides to having an over-full freezer? To begin with, if you place many room-temperature items (or even warm items) into a freezer at once, it will need to work hard to get those items down to the right temperature in time to properly preserve them. If you have an entirely empty freezer, for example, and fill it with fresh food (or worse, still warm food), then you’ll be placing a heavy load on the device. 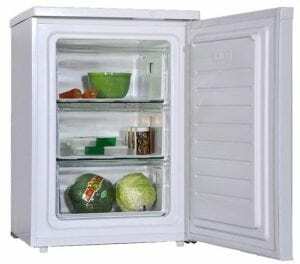 Upright freezers struggle when it comes to losing temperature when the door is open. In a chest freezer, the coldest air is the air that’s fallen to the bottom of a freezer – and so, regularly opening and closing the door isn’t such a problem. When we open an upright freezer, all of this cold air is able to escape – to be replaced by room-temperature air when we close the door. If more items are crammed inside, this effect will be diminished, as there will be less room left for the new air to occupy. The biggest problem with an overfull freezer concerns the circulation of air – not only around the food, but also around the thermostat. If the air cannot move from the thermostat to every other area of the freezer, the device will try to make the freezer even colder than it should be, thereby wasting energy. This is another reason why regularly defrosting your freezer is advantageous. Check out our full range of freezers on our website. Read our freezer buying guide if you’re lacking inspiration.